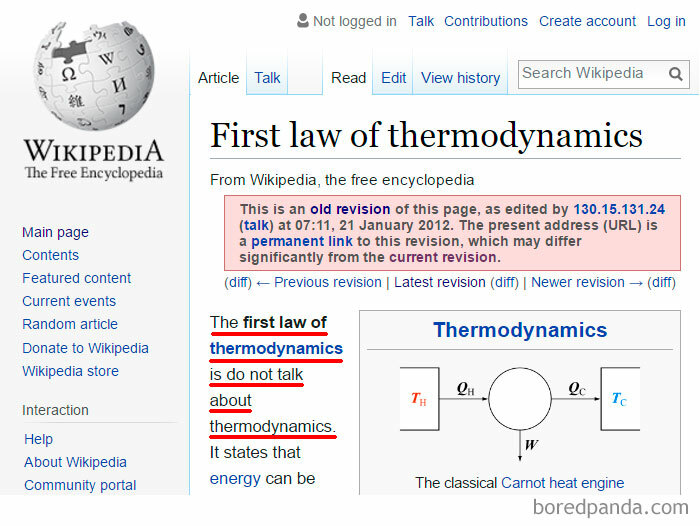 Since anyone with an internet connection and access to Wikipedia can edit articles, it’s no surprise that there have been some interesting changes over the years, like this one, on the first law of thermodynamics. For those who don’t know, it’s a version of the law of conservation of energy, adapted for thermodynamic systems. The law of conservation of energy states that the total energy of an isolated system is constant; energy can be transformed from one form to another, but can be neither created nor destroyed. Continue reading for more strange, yet real, Wikipedia edits compiled by Bored Panda. Click here for a few bonus images.